What once took one or more people to do, can now be accomplished with one robot, which contributes to significant reduction in material handling, orientation time, parts inspection, and training. Automation improves the response time as products flow from operation to operation. Sub-assemblies can be integrated into the automation line in order to eliminate individual workstations. Manufacturing can now be performed 24/7 without fall out of operator error. Automated product inspection, and in-process testing to verify the product is correct before sending it to the next operation. When automation is used to test products, the parameters must be quantified so the products are accepted or rejected according to those parameters. This eliminates the subjective decision-making and potential for operator error, which is present when testing is manually done. Robots can be programmed to perform a multitude of tasks. Once programmed, robots will do the same job consistency without fatigue. This is one of the reasons automation projects are often initiated when an operation is dangerous, strenuous, or monotonous. In most cases, the productivity gained by eliminating the difficult or repetitive operation will justify the expense of automation. Many companies today are moving to an automated and integrated manufacturing facility. With so much time and effort put into automating and streamlining production, it is imperative to keep these machines in working order. Almost all automated machinery is connected by quick disconnect electrical connectors for faster replacement. However, without good quality connectors, manufacturers will spend more time and money for replacing these connectors. Mencom Corporation is one of the industry leaders in Industrial Automation Connectors, and has a great reputation of producing top quality products. 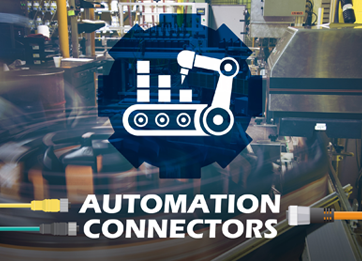 Whether you need connectors for power, data, communication, sensing, or any other industrial application, Mencom has the connection the automation manufacturers are looking for.